The Smithsonian Institution is shaking off its image as “the nation’s attic” brimming with arcane treasures and using Web and mobile projects to enlist the public in delving into its collections, expanding its research and, sometimes, just adding interesting postscripts to history. Best known for its stately museums on the National Mall, the 164-year-old Smithsonian also conducts wide-ranging scientific research, part of its original mission to increase and spread knowledge. But instead of relying on its small cadre of experts, the institution is embracing social media to involve the public. “We are more than museums,” said Michael Edson, the Smithsonian’s director of Web and new-media strategy. No more than 1 percent of the huge complex’s 137 million items are on public display at any time. “We’re operating telescopes in space, preserving ancient languages, studying biodiversity, evolution and history — a vast distributed network of scholars and researchers active in over 100 countries,” he said. In addition to bolstering scholarship, social media also is helping the Smithsonian solve puzzles like identifying an early 20th-century woman whose illustrations humorously conveyed economic data to the public, or the purpose of the “perforating paddle” used by early postal workers. Also, the Smithsonian has been able to uncover new information about historic events like the trial of John T. Scopes for teaching evolution, and assemble a worldwide network to capture wild animal behavior and another to map American tree species. “What we are doing is more lively and accessible than developing an exhibit and providing a catalog,” said Mr. Edson. Crowd-sourcing and user-generated content are not new to the Smithsonian, said Pamela Henson, the institution’s historian, pointing to the creation in the 1850s of what later became the National Weather Service. The Smithsonian’s first secretary, Joseph Henry, enlisted volunteers around the country to gather observations about storms and other weather occurrences and to mail or telegraph them to Washington. Even so, the 21st-century Smithsonian was somewhat slower to embrace unfettered public involvement, fearing it would undercut the institution’s scientific credibility. After debate, the Smithsonian began moving ahead in the social media realm in early 2009, encouraged by its new secretary, G. Wayne Clough, who had served as president of the Georgia Institute of Technology. The use of social media led to identification of a photograph that had been on the Smithsonian “Portraits of Scientists” since 2003. 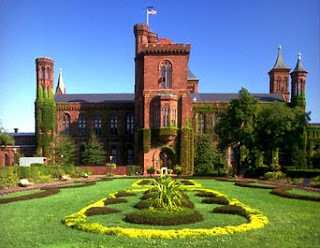 The Smithsonian added the image to its photo-sharing Web site,. Flickr users began contributing clues, like a wedding announcement, to pinpoint the woman in the picture as 21-year-old Ida Elizabeth Sabin Goodwin, an artist hired in the 1920s at a science news service. Her granddaughter, Linda Sabin Eisenstadt, recognized the Flickr photo and contributed details of her grandmother’s life and some of her drawings — noting that she had found two unknown cousins as a result. Ms. Goodwin’s “cartoonographs” amusingly depicted rising commodity prices, political campaign spending, spending on oil and the impact of new communications technologies, all still timely topics, said Effie Kapsalis, head of Web and new media for the Smithsonian Archives. Previously unpublished photos of the Scopes trial in Tennessee posted on Flickr resulted in a donation of 10 black-and-white photographs from Henrietta S. Jenrette, who said they had been taken by her father, who attended the trial with his former high school biology teacher. She wanted them to be online for anyone to see. With more than six million objects, and only four curators, the National Postal Museum created an online database called Arago for those who want to study particular objects, said Marshall Emery, the museum’s internal affairs manager. While the postal museum is small compared with other Smithsonian museums, its Web site, named after Francois Arago, a French scientist and friend of the Smithsonian’s founder, James Smithson, drew 26.4 million page views from 158 countries in fiscal 2010. Philatelic experts around the world can research — and sometimes pinpoint inaccuracies in — the museum’s collection, which includes every United States postage stamp, Amelia Earhart’s flight suit and unusual objects like an 1899 perforating paddle that was used to stab holes in mail envelopes so it could be fumigated inside railway mail cars. The purpose was to prevent letters from carrying yellow fever, then thought to be spread by such contact. A recently introduced Smithsonian digital endeavor to discover what environmental factors most influence the size of wildlife populations relies on a broad network of volunteers, rather than specialists. In late February, its Museum of the Natural History introduced “Smithsonian Wild,”, with links on Facebook, Flickr and Twitter. It can “can only be accomplished using citizen scientists — not unlike the annual bird counts — only this is for mammals, which are mostly nocturnal,” said Robert Costello, the museum’s outreach program manager. The site brings together 202,000 wildlife photos from various Smithsonian and other research projects where motion-sensitive cameras were installed to capture close-range images of elusive species like the jaguar. This gives the public “a better sense not only of the diversity of wildlife, but also of the diversity of the Smithsonian’s wildlife research,” said Mr. Costello. On the heels of that project, the Smithsonian began broadening its mobile offerings with a free new app, called Leafsnap, to identify tree species by their leaves. Smartphone apps typically help users to navigate their visit — the Smithsonian has them for its popular National Air and Space Museum as well as the Postal and Natural History — and to complement specific exhibitions. Leafsnap is the first of a series of electronic field guides that researchers from the Smithsonian, Columbia University and the University of Maryland have developed to help identify species from photographs. The Web site field guide currently includes the trees of New York City and Washington and will expand to include trees across the continental United States. The app can also be used to map tree diversity and location by sending global positioning data back to scientists. Other apps to raise awareness of biodiversity will be introduced in the future. Article is from the New York Times.